Its Hurricane Season folks, so come out to Lumberton NC @ the lumberton Indoor Flea Market located at 612 2nd st. and join the wrestling fans in the SHELTER. RWC has the Family covered for this event. 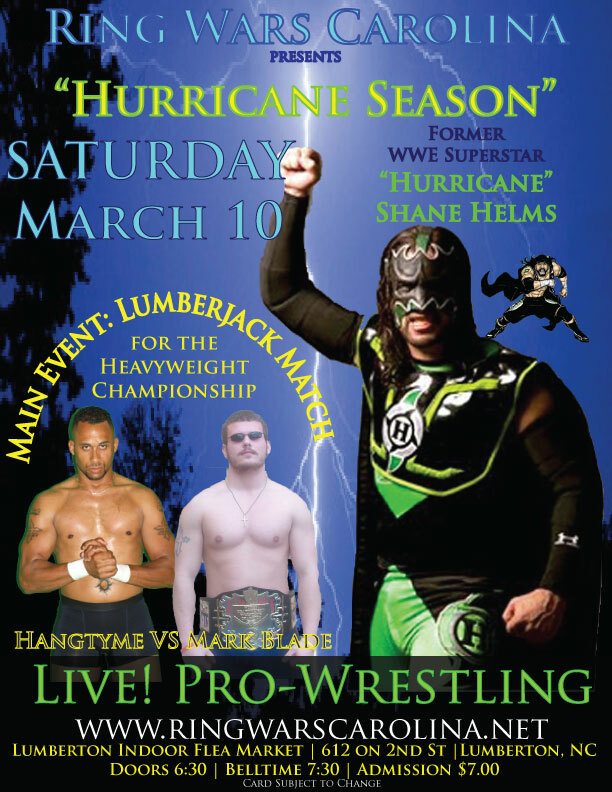 Former WWE Superstar Shane "Hurricane" Helms will be in the building to meet and greet all the fans. You never know who else will be there or what Hurricane may do? The RWC title is also on the line in a Lumberjack match. The Champ, Mark Blade taking on Hangtyme. You never know how this is going to end! Tag Team champs, BD productions will be in the house showing why they are the champs. All the RWC superstars will be in attendance to make sure your family has a great time. RWC Tag Team champs in the building, Lumberjack Match for the RWC Championship, Last but not least, Former WCW, WWE and current Lucha Libre Superstar Shane "Hurricane" Helms in the building. The foundation will be moved!! !